Installation is definitely easier than in previous versions. A nice improvement is the copy/past feature in the module unlock box. This is especially convenient since I received my unlock codes via email. (You will need to obtain new unlock codes if you are upgrading modules you owned prior to BW8. So long as you purchased the unlocks before, you’ll receive new codes compatible with BW8 for free.) I recommend the DVD installation rather than keeping track of multiple CDs! For some reason, my purchase history was split up into two separate accounts on BibleWorks’ database, thus I didn’t receive all my unlock codes when I upgraded. I sent an email to customer service one evening and they responded the next day–problem fixed, codes sent. I’ve always received prompt responses from customer service. 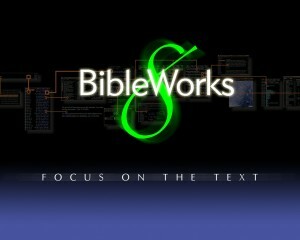 One of BibleWorks’ greatest strengths has improved: the number of resources that come with the stock package. BW8 now comes with grammars by Wallace, Waltke & O’Connor, and Joüon & Muraoka (I had previously purchased Wallace). A few other new freebies which interest me: Greek Pseudepigrapha, Charles’ Old Testament Pseudepigrapha translation, Moulton and Milligan vocabulary module, and Greek sentence diagrams (I have not thoroughly digested the diagrams yet). For those who have not used BibleWorks, I’ll highlight a few of my favorite resources which are available in BW8: BDAG and HALOT (require the purchase of an unlock code), Apostolic Fathers (includes a tagged Greek edition, a latin edition, and an English translation), and BDF (requires a purchase of an unlock code). You can find a full list of resources here. Only a couple of minor ones. The LXX lexicon by Lust, Eynikel, Hauspie, and Chamberlain is now a locked module (note: BW7 users who upgrade still get it free!). I love a good lexicon. The more the merrier. The program load time has not improved much relative to BibleWorks 7. My system: I run the program on Windows XP on my mac (via virtualization software). Right now I have 712 MB of RAM devoted to XP, but BW8 is still a bit sluggish in loading. I will look at a few improvements to the analysis window, and a feature that Accordance and Logos have yet to rival.